The knuckle, or beef tip, is one of three main parts of the round and is one of the most versatile cuts of beef. 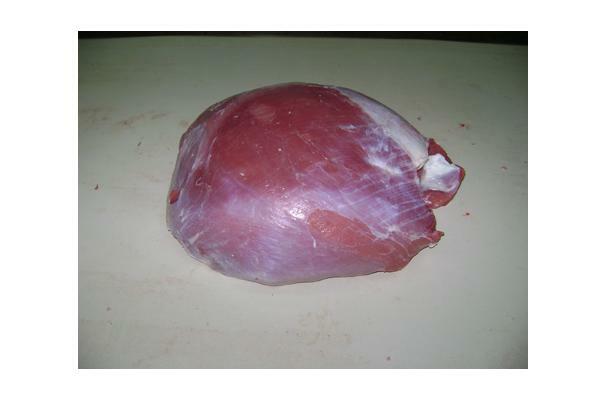 The trimmed tip is most commonly found in butcher shops. It can be cut into countless items - London Broil, in strips to use in Stroganoff, cubes for kabobs, roasts, etc. Beef knuckle is a solid muscle group weighing 12 to 16 pounds that has had the tri-tip muscle removed. It lies at the top of the round just beyond the sirloin and is the muscle group just above the kneecap. Food complements: Allspice, Cumin, Garlic, Hot peppers, Marjoram, Mushrooms, Mustard, Onions, Oregano, Paprika, Thyme. Choosing: Allow 6-8 ounces per person. Buying: Usually found cut up as roasts or steaks. When sliced into strips or chunks it can be used in Beef Stroganoff. Depending on the cut it can be used in dishes such as Boeuf Bourguignon, Pot-au-feu, kabobs, in stews, etc..
Refrigerate roasts up to 4 days, steaks up to 2 days.